There are theories of modern physics that predict the existence of a very large number of universes: we will be just one of them. Of course, exotic theories! But scientists soon hunt the possible traces of our universe from this other universe. We know that the universe we live in is enormous: we can see objects like quasars from about 10 billion light-years away. Is the Infinite Universe? A question we do not have today. Is this the only universe? But there are some theories that claim that besides our universe, the one we see with our devices may be much more, perhaps even an infinite number: similar to ours or very different. For example, a whole where another physics is valid, so the standard model of elementary particle physics will look quite different. In this universe there can or cannot be life. Such a theory, for example, is string theory. Scientists have come to the conclusion that this theory allows the existence of 10 to 500 power (such a one result of 500 zero!) Whole !!! Is this? Hard, if not impossible, to say. Laura Mersini Houghton, a theoretical physicist at the University of North Carolina (USA), recently developed a theory claiming that other universes can leave traces on our universe. A kind of fingerprint that if we could decipher it, we could indirectly study these parallel worlds. What is it? 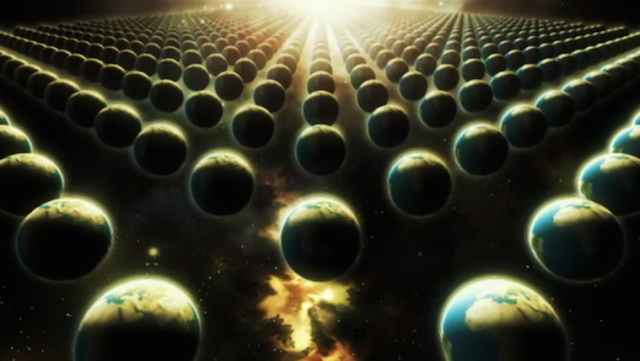 In this theory, it is argued that parallel universes can leave traces of background cosmic radiation. This radiation of electromagnetic nature is the presence throughout the universe and represents the radiation that remained to the Big Bang when the photons - due to the expansion which photononium reduces - can no longer remain the hydrogen atoms, the remaining "stragglers" by the universe. At present, the equivalent temperature of this background radiation is about 2.7K, and as a result of the expansion of the universe it is constantly decreasing. This type of radiation is heavily studied because it helps us to better understand the history of the universe. Measurement of this radiation is usually done with instruments on board the satellites, apart from the earthly atmosphere that disturbs the measurements. What scientists study is how uniform this radiation is. It has been concluded that there are small differences between regions - differences that may be related to quantum fluctuations since the Big Bang and which led to the formation of current structures (eg galaxies). Here, however, the same radiation can be affected by the existence of another universe as we live. Interactions with our universe can leave measurable traces. This is exactly what Laura Mersini Houghton claims. The Plank scientific research project, aboard a satellite from the European Space Agency, made it possible to make very accurate measurements of background cosmic radiation. There are some deviations that can be interpreted as a result of clashes between our universe and other universe. Obviously not everyone is convinced that this is the explanation. In addition, we need more and more accurate measurements so we can get stronger conclusions.